Comic Pop comes with 60 hand-drawn comic book style animations that will give you a professional look in seconds and save you tons of money! In addition to the animations, Comic Pop comes with 2 title templates, 2 logo templates and 2 transitions. All Comic Pop’s animations are perfect for all professional applications including broadcast. The animatinos are vector based so you can change the size without any resolution loss! Use these animations to add energy to your next video production. Quickly add a uniquely animated element that will impress your clients, boss, friends and family. Light your video on fire! Comic Pop has 60 customizable animations in 6 categories. There are electric, energy, fire, lines, shapes and smoke animations. There are so many ways to add dynamism to your project. Comic Pop is distributed through the free FxFactory engine. After you’ve installed FxFactory you’ll have a demo to play with and you can buy securely from Final Cut Pro X. 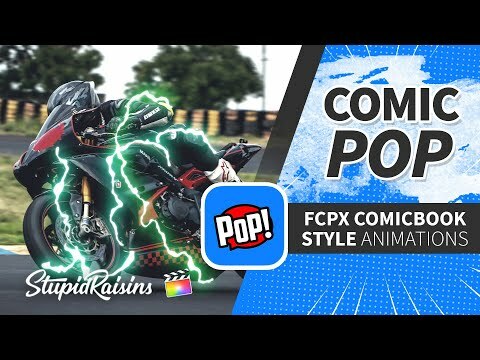 Just download and install FxFactory, restart Final Cut and you’ll have Comic Pop at your fingertips. You can find Comic Pop under Titles and category name Stupid Raisins Comic Pop. To use Comic Pop just drag and drop the Title into your project timeline. For Final Cut Pro X Only. Requires the FxFactory Engine (Free Version of FxFactory Pro - Download). Learn More about FxFactory and FxFactory Pro.